In a recent Road Crew Chat on STLtoday.com, one person had a question regarding jaywalking near the North Hanley MetroLink station. mike: at north hanley and I-70, there are pedestrians crossing hanley from the apartment complex between the gas station and university place to get to and from the metrolink station due to the stairs to metrolink station being directly across from the gas station. every morning and night i see people darting out on hanley and there are near misses w/ cars every day. these are accidents or a death waiting to happen. can a pedestrian bridge be built or a fence put up to make pedestrians cross hanley 20 yards down at the stoplight at university place? very dangerous. Linda Wilson, Todd Waelterman and David Wrone: I know this has been posted many times before. Hanley is a County Road, but I’m going to give you a little answer anyway. As far as I know, there are no plans to build a pedestrian bridge. These pedestrians are jaywalking and should be crossing at the intersection crosswalk. Perhaps you might want to call the local police. Before the police are called, perhaps we should take a good look at the area to find out why people are jaywalking in the first place. The only marked crosswalk across Hanley Rd in the area is to the south at University Place Dr. Using that crosswalk, however, adds the equivalent of 3 football fields to the walking distance required. Would you walk an extra 900 ft just to use a marked crosswalk when there’s a convenient safe median to stand in? Didn’t think so. 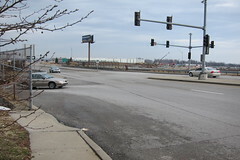 An unmarked crosswalk does exist to the north at the North Hanley interchange with I-70 of which the southern intersection. However, a quick look at the concrete shows that zero accommodations have been made for pedestrians wishing to cross Hanley. Crossing at this intersection may actually be more dangerous than the existing jaywalking problem given that a portion of sidewalk is missing from the west side of Hanley right at the exit ramp from eastbound I-70. In the end, the police could be called to enforce the law and a fence installed in the road’s median, but neither will solve the jaywalking problem. Rather the jaywalking at this location is a result of the poor roadway design and lack of accommodations for the many people who need to cross the road. MoDOT, St. Louis County, Metro, someone needs to make changes to the road before someone gets hurt. oooo! I hate fences in the median! Compared to the Missouri Department of TRANSPORTATION, the County Department of HIGHWAYS may even be less responsive to treating this STREET as something for all users, including people (you know, what all of us are, in addition to pedestrians), especially in an urban setting. Anonymous, while I tend to agree with you, they did say they'll look at the situation in the most recent Road Crew chat. We'll see what becomes of it.